Adjustable rate mortgages have interest rates that change periodically. Such loans have an introductory period of low, fixed rates, after which they vary, depending on an adjustment index. An adjustable rate mortgage is a loan with an interest rate that fluctuates. The initial interest rate of the ARM will likely be lower than many fixed rate mortgages, but this only lasts for a certain amount of time. After this introductory fixed-rate period, your monthly payments will increase or decrease according to the interest rate which is tied to an adjustment index. Adjustable rate mortgages come with “caps” and “ceilings” that put limits on the increase of interest rates over the life of the loan. These help prevent your monthly payments from getting too high, and help look past the uncertainty that comes with ARMs. When interest rates falls you don’t have to go through the hassle of refinancing and paying the fees that go with it. 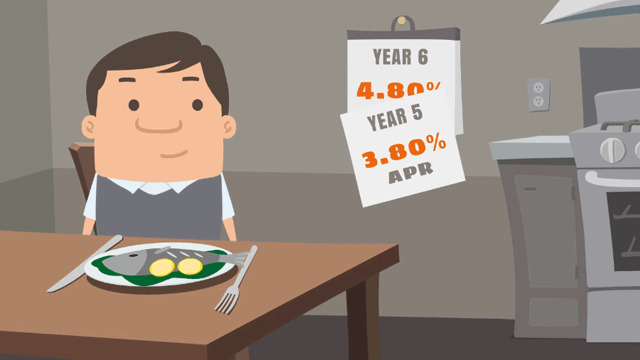 Instead your monthly payments adjust automatically to reflect the lower rates. The lower introductory rates mean your payments for the first few months are going to be small. Take advantage of this time to save and invest the extra cash for a larger return. Budgeting is not easy. Having to work around fluctuating monthly payments makes it difficult to create a household spending plan and savings. Refinancing an adjustable rate mortgage is pricey. If you choose to switch to a fixed rate mortgage, you may end up spending more money than what you would have, sticking with rising interest rates.